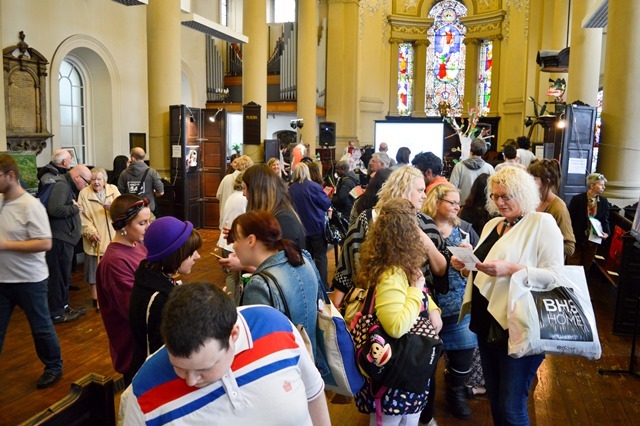 As part of this year’s Learning Disabilities Week, Holy Trinity Church hosted the launch party of BEYOND, a brand new arts festival coming to Leeds in June 2016. BEYOND will celebrate the work of artists, performers and musicians with learning disabilities and aims to bring new textures and dimensions to a body of work you might normally see exhibited in Leeds. Starting next June 2016, the festival programme and will be curated by a steering group made up of artists with learning disabilities and staff from each of the partner organisations. This is the first time a festival led by people with learning disabilities and which showcases the skills and talents of work by people with learning disabilities has happened in Leeds. To find out more about the festival, I went down to BEYOND’s launch exhibition party which showed a fantastic range of visual artwork, film and even a performance by thrash metal band Ultimate Thunder! During the launch I spoke to Liam, an actor and director from Buzz at First Floor (West Yorkshire Playhouse) and a member of the festival’s steering group. Liam spoke to me about his own experience of the arts scene in Leeds and his vision for BEYOND. Hi Liam, tell us about BEYOND, and what the festival aims to do in Leeds? Our main aim is to show the city and make people aware that disabled artists can organise their own festival as I think people have the assumption that we can’t do these things. Organising this exhibition has been a really thought out process and as well as the finished exhibition, we wanted to show people the process of creating the exhibition and how we’ve sorted stuff out. I think people came to the launch party not knowing what to expect, but they’ve gone away with the perception that disabled artists can organise a really good exhibition, so we’ve challenged those assumptions. BEYOND is a way of showcasing the great work artists with learning disabilities are creating in Leeds. What’s currently on offer for artists with learning disabilities living in Leeds? There are lots of things going on by organisations such as Pyramid of Arts, Buzz at the West Yorkshire Playhouse where I work, ArtLink, the Arts & Mind Network who organise the Love Arts Festival the list goes on. Before BEYOND it appeared only a few organisations were arranging exhibitions like this, but if you delve a little deeper you find loads of different people are doing it. BEYOND is a way of coming together to celebrate that, particularly during Learning Disability Awareness Week. Do you think the current wider arts scene in Leeds is accessible to people with learning disabilities? Yes, in terms of physical buildings, but it seems the two worlds don’t talk to each other, so learning disability artist groups don’t always know about things that are happening. BEYOND aims to bridge that gap. 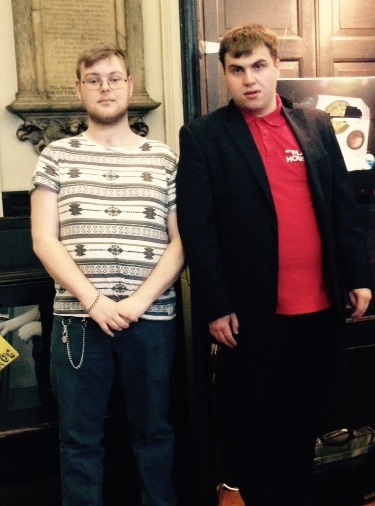 How do you see the future of Leeds’ arts scene for people with learning disabilities? In the future, I’d like to see artists collaborate and it not to matter whether you’re disabled or not, BEYOND is a step towards this happening. Thank you Liam, you’ve given us lots to think about and we’re looking forward to the first BEYOND festival in June next year. Liam (left) with his colleague Lewis also from BUZZ at First Floor. This entry was posted in Achievement, Choice, Health and Wellbeing, Information, Learning disablity, Mental Health, Uncategorized, Working together and tagged Arts, celebration, choice, collaboration, collaborative working, community spirit, Festivals, independent living, learning disabilities, learning disability, stories. Bookmark the permalink.